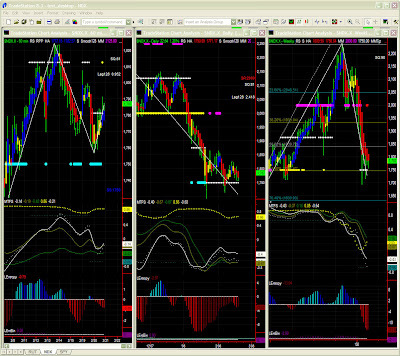 Dominant TF: 60mins, but weekly chart also. Less than a 20 point range over the last few days. 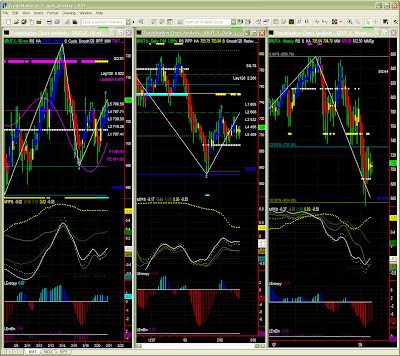 RUT is trying to go north, in an overall environment that remains fairly bearish. MTFS shows capacity to reach ans test target level (MM pivot & Fib target) just below 720. We can notice that 688 also turned to stronger support. Does that mean our market woes are over? Too early to say. Indeed we did not get a clear bounce pattern and Entropy remains pretty weak. So while the bias is up for now, there might be further hesitation going forward. Significance level is now quite low at this time frame. MTFS remains flat and Entropy is not helping us either. There is no reason to be particularly bullish right now, as RUT could still go either way. In absence of a market shock it could take a few days for a new pattern to materialise. As mentioned last time, we are now having a pause in this bear market, with the MTFS white line hooking up. It should not be strong enough to justify a strong recovery but the white/brown lines crossover may indicate an interruption of the fall. 625 was a strong support (688 in lower dominant time frame), as 1750 was on NDX, so the market is probably showing willingness to stay above those levels. Having said that, we have to see the end of the pattern now with the green line joining the party close to oversold levels, either after a further drop or just through the passage of time.